Since we acquired a fancy new BBQ back in January, you could probably say that my Irishman and I have been more than a little obsessed with cooking outdoors this year. Even in the depths of Winter, here in the Snowy Mountains, we’ve been rugging up and firing up the barbie most weekends. There has, of course, been a lot of experimentation. Different charcoals, different types of wood smoking chips, super high temperatures, long slow low temperatures, different cuts of meat, different veg… I could go on. It may surprise you, though, there’s been one area that we haven’t really gotten into. It could be scars from an earlier unsuccessful attempt. But when I think about it, it’s more about being organised. Proper marinades take a bit of planning and let’s face it. Time. A few months back, I had the brilliant idea to start playing around with post-cooking marinades. OR what you could call sauces. So while the BBQ king has been busy working his magic, I’ve been whipping up my little marinades. As soon as the steak, or whatever is done, it has a tasty bath to rest in. No forward planning, no extra time, AND maximum flavour. The best thing is that the smoky meat juices accumulate in the marinade, giving the best tasting sauce. We’re talking the perfect ‘marinade’ for when you’re short on time and keen to get food on the table. Today I’m sharing the recipe for my current obsession. I wish I could say it was all my idea. But the truth is, there’s a whole nation of BBQ lovers who are ahead of me on this one. You have to admire the Argintinians and their chimichurri sauce. So versatile, so delicious, so quick – the perfect ‘marinade’ for all cooks really, but especially those who are tired, hungry and in a hurry. I’m not sure that the Argentine grilling king, Francis Mallmann would agree, but tofu and chimichurri are seriously a match made in heaven. Tofu bringing the lovely soft texture and substance to the partnership. And chimichurri filling in all the glorious details of flavour, sharpness and colour. I’ve just bunged it all on top of some baby spinach leaves, for some instant veg / salad that gets dressed as well with our hero sauce. If I can’t convince you to try this with tofu, by all means serve with your favourite steak or some grilled chicken or even fish. 1. Place a frying pan on a high heat. 2. Drain tofu and cut in half so you have two large flat ‘steaks’. Pat tofu fry with paper towel. 3. Place a little oil in the pan and fry the tofu for 2-3 minutes on each side until well browned. 4. Divide spinach between two plates. 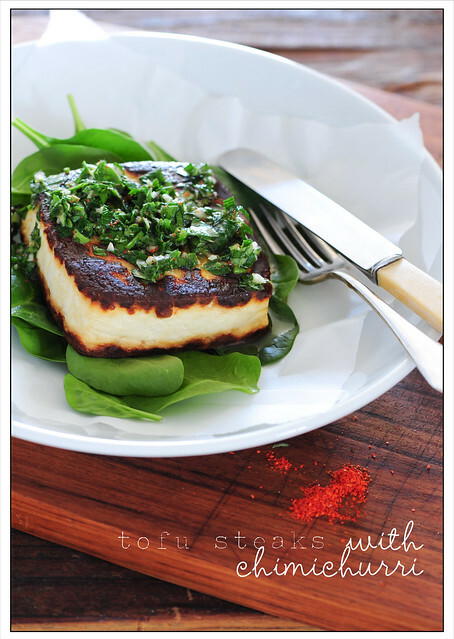 Top with tofu steaks and finish it off with a generous dosing of the chimichurri sauce. makes about 3/4 cup – enough for 4 people. Feel free to play around with this recipe. Especially the garlic levels and the seasoning. Mallmann recommends ‘always red wine vinegar’ but I’m happy to go out a limb here and say that sherry vinegar is even better. Sometimes it’s good to live dangerously. A super versatile sauce, I’m struggling to think of something it wouldn’t enhance. So far I’ve tried it with tofu, steak and chicken and they’ve all been super delicious. Keen to try it with fish next. Especially oily fish like mackerel or sardines. 1. Combine sherry vinegar with 1/4 teaspoon salt, 1/4 cup water and 1/4 cup extra virgin olive oil. Stir until salt is dissolved. 2. Finely chop herbs and add to the sauce along with the chilli and garlic. 3. Stir until well combined. Taste and adjust seasoning as required. § Eggplant parmigiana in 15 minutes? § Have you mastered the most important cooking skill? And I’ve set a date for the launch of my new eCookbook – ‘The Tired & Hungry Cook’s Companion’ – 12th October. More details soon! I am so looking forward to trying this. Might even try it with some Paneer (Indian cottage cheese) in place of the Tofu and see how it turns out. . Yummo! 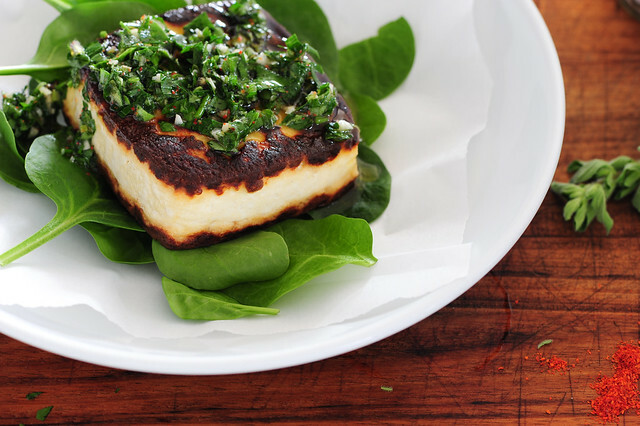 Never tried cooking with tofu before – this looks interesting…will give it a try! Great recipe! I just tried cooking tofu for the first time and had no idea you could make it as a ‘steak’ and brown it like that. Thanks for sharing! turkey wings or thighs; not a big fan of tofu. this is one beautiful recipe! i don’t think i’ve ever had chiimchurri sauce??? I didn’t know the name of this sauce, but i make a similar kid for pasta .. i add a lil bit of lemon juice too! Coming to marinading meat .. I usually add that and then grill .. but i think u are suggesting to do that after .. which I think will make the meat juicy .. which is an excellent idea! Should try it next time. my staple diet was red wine and white breadrolls dipped in chimichurri sauce. ok, maybe not the healthiest, but i *was* 23 then. and vegetarian. but even still, i love this sauce. I was looking for a good recipe to use up some Tofu I have in the fridge when i stumbled into this recipe, I’m glad I did. Sounds really delicious! 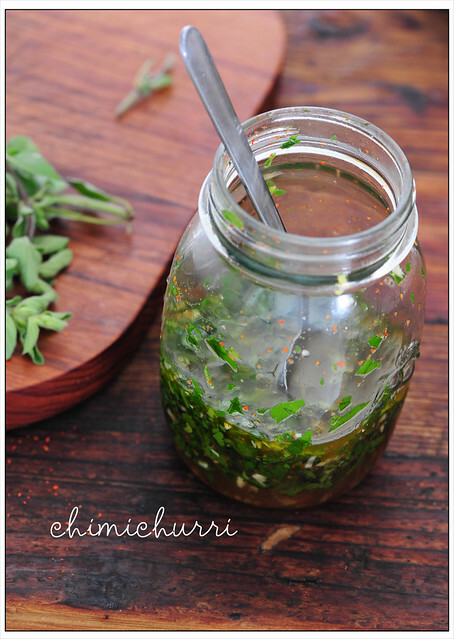 I couldn’t agree more, I’m hard pressed to find something that chimichurri doesn’t taste amazing on. The only thing I can think of is ice cream. Then again, who knows, maybe chimichurri flavoured ice cream may be delicious! How interesting? I just mentioned to someone how much I need food that can be prepared quickly and with little fuss, because I am almost always hurting owing to back pain exacerbated by standing, which posture is almost essential for shopping, putting groceries away, food prep, cooking, cleaning-up and washing dishes and putting everything away. And in spite of another Canadian loving your new book I’m wary. And also on a small, senior’s budget, and dislike meal plans that use different ingredients every day, meaning I have to cook everyday, and that require lots of ingredients found in the southern U.S., or Australia, but if found here at all, are out of my budget. Is there a preview of your new book. I’ve just subscribed. I have some tofu waiting in the fridge…this recipe sounds perfect! Never thought to use chimi with tofu…brilliant!